But hydrogen power still faces major infrastructure challenges. 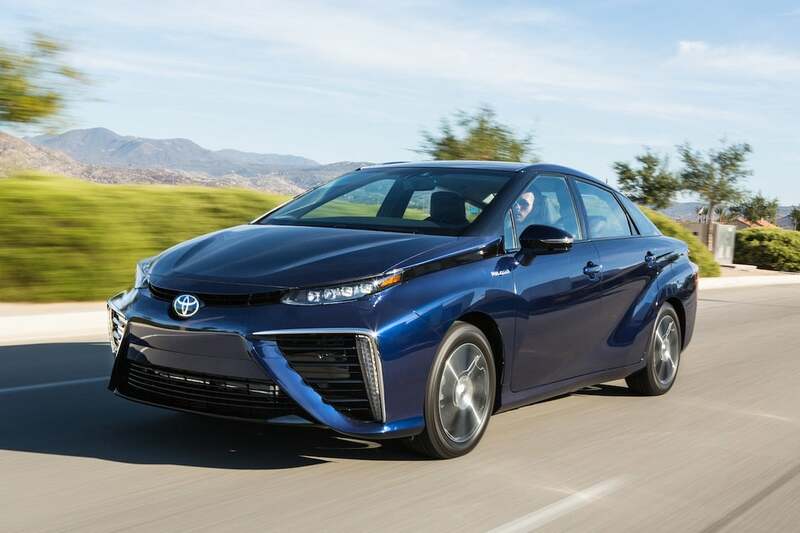 The Toyota Mirai fuel-cell vehicle went on sale in Southern California late last year. 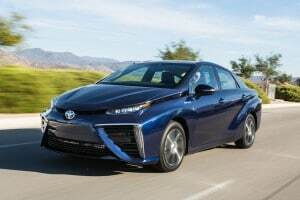 While new, long-range electric vehicles, such as the Tesla Model 3 and Chevrolet Bolt, have dominated headlines lately, a number of major automakers are working up a green alternative, and at least 17 new hydrogen fuel-cell vehicles will be on the market around the world by 2027, according to a new study by IHS Automotive. There are currently just two, the Toyota Mirai and Hyundai Tucson Fuel Cell Vehicle, with Honda set to launch its new Clarity model later this year. But manufacturers such as General Motors and Daimler AG are working up their own offerings. The big challenge is coming up with the refueling infrastructure needed to support hydrogen powertrain technology. “This could be a ‘now or never’ situation for FCEVs (fuel-cell electric vehicles) in mass market mobility,” said Ben Scott a senior IHS analyst, depending on the simultaneous launch of more vehicles and the addition of refueling stations. 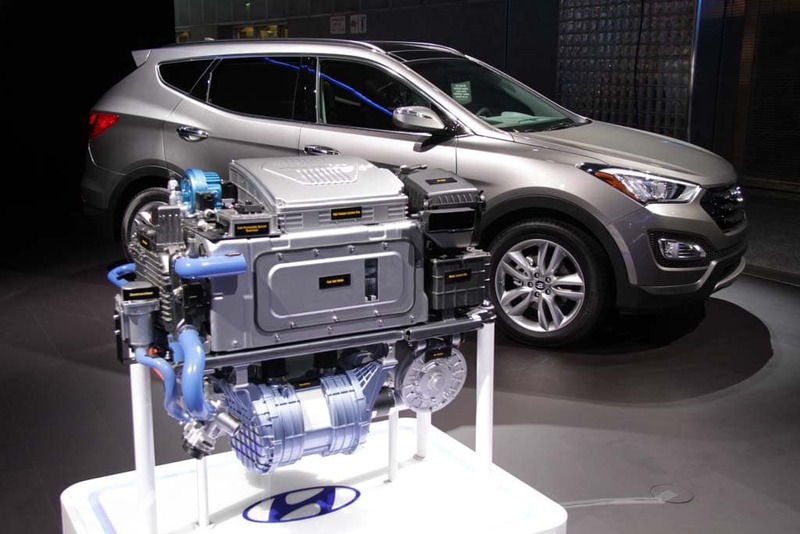 According to the study, the biggest growth in hydrogen vehicles will come in Japan and Korea in the near-term. Both countries are promoting the zero-emissions technology – Japan planning to give hydrogen vehicles a high profile presence during the 2020 Tokyo Olympics. Hyundai's fuel cell stack shown in front of the Tucson. But Scott anticipates that Europe will take the lead by 2021, in large part due to the European Union’s push to slash emissions of global warming carbon dioxide. Germany, in particular, has laid out plans to set up a nationwide network of hydrogen fueling stations. In the U.S., meanwhile, only a handful of refueling stations exist, mostly in Southern California. As a result, the Mirai and Tucson — and soon the Clarity – are only being offered in the Orange Country region. But lawmakers have approved funding for a statewide hydrogen network, in line with Germany. Among the questions is where the raw hydrogen will come from. The lightweight gas is the most abundant element in the universe but does not exist in its raw form on Planet Earth. It can be sourced from various fossil fuels, such as coal or natural gas, or by electrolyzing water, splitting it into two parts hydrogen, one part oxygen. All those methods have drawbacks, and skeptics say that unless producers turn to renewable energy sources, hydrogen is not nearly as clean a fuel as promised. 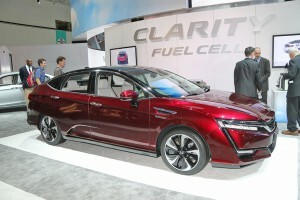 Honda revealed its Clarity fuel-cell vehicle in LA, and will put it into production later this year. The gas is also more expensive than the electricity used to charge a battery-car, though if production scales up, experts believe hydrogen will become competitive with gasoline in most global markets. On the positive side, hydrogen cars can be refilled much like a conventional, gasoline-powered vehicle, typically in five minutes or less, and will get around 300 miles range. “Refueling habits with an FCEV will be very similar to that of a conventional car. This will definitely help with customer acceptance of FCEVs,” said analyst Scott. While the number of hydrogen cars will increase rapidly by 2027, the study predicts sales will remain niche, about 0.1% of total global automotive production, or barely 70,000 fuel-cell vehicles annually. The real test of the technology will take about 25 to 30 years, according to IHS. If consumers haven’t embraced hydrogen by then it could fade away or remain in use only in select niches. This entry was posted on Friday, May 6th, 2016 at and is filed under Automobiles. You can follow any responses to this entry through the RSS 2.0 feed. Both comments and pings are currently closed.